The International 2016 is here! 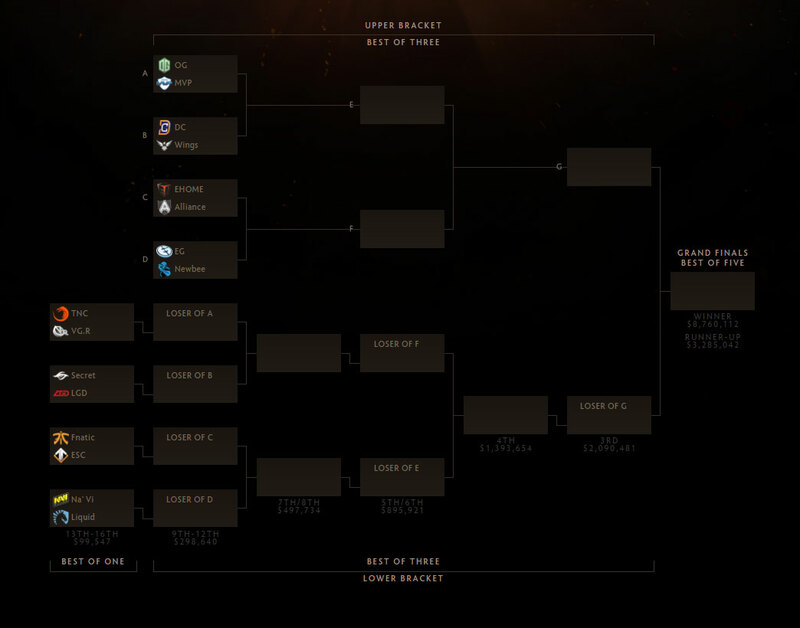 Valve’s own Dota 2 [official site] uber-tournament is underway in Seattle, with sixteen teams wizard-fighting for a share of the frankly ludicrous $19,860,000 (and rising) prize pool. Even ignoring the cash this is very much “the big one” where competitive Dota 2 is concerned – victory at TI6 will earn the kind of prestige that even the previous Frankfurt, Shanghai and Manila Majors can’t confer. The group stages have already concluded, and on Monday 8th August the proceedings move to the main stage at long-time TI hosting grounds Key Arena, concluding with the grand finals on Saturday 13th August. Since the group stages only determine which teams are assigned to the double-elimination format’s upper and lower brackets, all sixteen teams are still in with a shot – here’s who they are, and who to keep an eye on! As the only team to ever win two Valve-sponsored events, the Frankfurt and Manila Majors, OG are definitely amongst the favourites, especially after securing their upper bracket spot with relative ease. Then again, with success comes attention, and so OG will need all their individual skill and strategic flexibility to survive having those inevitable targets on their backs. Like OG, Team Liquid formed during the tumultuous post-TI5 reshuffle, sticking together ever since to great success. However, a disastrous group stage – where their usually-immaculate drafting and gameplan execution repeatedly faltered – means they must now go through TI6’s lower bracket. Who’d have thought? No team has won The International twice, and while this is a very different Newbee to the lineup that ram-raided their way to the TI4 championship, they do have a hell of a chance to break that pattern. Not long after their record-breaking 29-game winning streak, this experienced Chinese squad have fought their way into the upper bracket with the momentum of multiple top-two LAN placings behind them. Fourth place at the Manila Major, second at Nanyang Championships Season 2… LGD Gaming looked strong going in to TI6 but struggled somewhat in their group, including one particularly painful loss to Na’Vi in a game that seemed certain to go the Chinese team’s way. They are playing with their substitute player Banana after main support, September, failed to secure his visa, but nonetheless are now staring down the barrel of a quick elimination from the lower bracket. It’s hard to root against The Wings Gaming; not only have they gone from no-name nobodies to TI6 invitees in eight months, but their mad drafts and ultraviolent playstyle make them a joy to watch. This entertainment factor is a constant, even if their actual competitive success isn’t. Wings are just as likely to bomb out in the first round of a tournament as they are to take the whole thing. At least their narrowly-secured upper bracket placement means that the former won’t happen this time. Natus Vincere are a funny one; this once-languishing yet perennially popular Ukranian/Russian team have recently mounted something of a comeback, but their group stage has been deeply mixed, showcasing both exceptional early-game prowess and a tendency to throw away advantages with bad mid-game teamfights. It’ll be interesting to see whether the famous “Na’Vi magic” (see that LGD match I mentioned earlier) will help them survive the lower bracket. Also, fun fact: midlaner Dendi is the only player to attend all six Internationals with the same team. He’s like the anti-MiSeRy. It seems weird to describe TI5 champions Evil Geniuses as a dark horse, yet here they are, sat at second in their group after weeks of slumping. While they had to slog their way through both the open qualifiers and the Americas regional qualifier, having forfeited a direct invite due to breaking Valve’s roster lock deadline, it seems to have done them some good – this is much more surgical EG than the one which collapsed at Manila in June, even if their final group stage match against Alliance saw them perform the most agonising throw of the tournament so far. Escape Gaming, a relatively young European team (though featuring veterans like Era and Synderen), squeaked through the wildcard qualifiers only to come comfortably last in their group. They’re now just one game away from elimination, but they do have form for pulling out wins against the odds – just look at this 77-min deathfest against Alliance from the last day of groups. Under the captainship of ex-Evil Geniuses member and living meme DeMoN, TNC Pro Team were the surprise winners of the Southeast Asia qualifiers and even made waves in the group stage, including a shock 2-0 against Wings. Sadly, though, they narrowly missed out on the upper bracket so they’ll need yet more upsets to survive the first elimination matches. Alliance are another surprise inclusion in the upper bracket; they qualified through the European qualifiers (beating Escape to dodge the wildcard) but had looked shaky in the weeks prior. Still, their playstyle – which combines an unusual emphasis on turning offlaner AdmiralBulldog into effectively a second carry with high risk, high reward plays like this zero-minute Roshan grab against Na’Vi – has shone through in Seattle. Following in the footsteps of CDEC at TI5, Chinese all-star team EHOME have emerged from the wildcard qualifier to become potential champions, walking Group B with the best win record of the tournament. It’s still a bit strange to see famed offlaner iceiceice playing carry, but there’s no arguing against the likes of this absolute dismantling of Team Secret (go from 10m49s). Despite being formed in a bit of a hurry mere hours before the Manila/TI6 roster lock, Digital Chaos have put on a career-best performance in the group stages, finishing only one point behind EHOME. Carry plater Resolut1on has been a particular standout, bringing the boldness of extensive midlane experience to pull off huge plays like this game-saving splitpush against MVP Phoenix. Also, fun fact: captain MiSeRy is the only player to attend all six Internationals with six different teams – Meet Your Makers, Counter-Logic Gaming, LGD International, Mousesports, Cloud9 and DC. He’s like the anti-Dendi. Due to the same visa denial issues that befell LGD, Vici Gaming Reborn are playing with a sub (Mikasa) instead of one of their mains (Yang) – and it shows. They finished bottom of their group and face an energised TNC in the elimination round – defeat would be a long way to fall for VG:R, usually one of Asia’s strongest, most coordinated teams. MVP Phoenix are the sole South Korean squad at TI6, and will carry that torch into the upper bracket – albeit with a 6-8 win-loss record which is worse than a couple of lower bracket teams from the other group. No-one would argue MVP didn’t deserve their direct invite to the event, but they may need to better execute their pacey, aggressive style to advance further. Team Secret have had an unexpectedly poor group stage. Like arch-rivals EG, they had to go through both the open and regional qualifiers to reach TI (due to, uh, swapping players with EG), but this initial success has turned to disaster with a nine-game losing streak that put them second from bottom in Group B. Midlaner Arteezy has played well but it seems their opponents have sussed how to punish Secret’s passive, greedy, farm-hungry playstyle. Fnatic haven’t fared much better, a shame after a season which saw them achieve very decent finishes at multiple premier tournaments. All hope is not yet lost, though; they have a favourable lower bracket matchup against Escape, while MidOne and DJ make a formidable core/support duo. The Dota 2 metagame is, mercifully, a bit more dynamic than the all-conquering push tactics of TI4 or the TI5 meta’s slightly tedious favouring of farm-centric mid heroes. There’s no single must-have hero or overpowered strategy, granting teams a bit more scope to embrace their own personal styles, though a few characters have emerged as highly-contested picks. Two of biggest are Huskar, a troll-thing who deals more damage the more he gets hurt, and Drow Ranger, a moody blue archer who grants huge bonus damage to herself and other ranged heroes on her team. Both change the rules of engagement in a way that makes it easy for them to get out of control if not properly countered and kept in line, which becomes particularly troublesome when they’re paired with supports that possess excellent life-saving defensive spells, like Dazzle and Oracle – also popular picks. Expect also to see a lot of Mirana (lady riding a giant white lion, or sometimes a griffon – you can’t miss her), who combines massive magical burst damage with the ability to stun enemies, leap away from danger and turn her entire team invisible. This sheer versatility has made her a frequent target for picks and bans in the draft stage. You can watch The International on Twitch or in the game client itself – if you choose the latter and own The International Battle Pass (proceeds of which go towards ballooning the prize pool even further), you can make predictions on each match and earn precious imaginary item-unlocking points. There’s also that new-fangled VR hub which lets you spectate matches from inside the map, peering at team-fights and using your Vive controllers to engage other spectators in dance-offs. The main event kicks off Monday 8th August at 6pm BST (seeding info here) with the first upper bracket games, followed by the first round of lower bracket games annoyingly running into the early morning, thanks to how the Earth and Sun and time works or whatever. Sleep deprivation aside, this is absolutely the tournament to watch if you’re even partially interested in competitive Dota 2, and with so many closely-matched teams plus a diverse meta, it should very much be a good’un. Stay tuned!